Good lighting can make or break the ambience in a room. For something truly unique that finally makes illumination fun again, check out the Bulbing Light, a really cool Kickstarter-turned-Moma Design Store product that combines simple materials with magical effects. 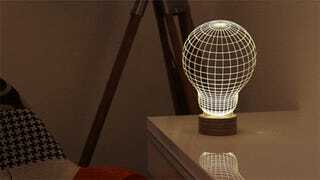 The lamp consists of a wooden base that contains simple LED lamp, on top of which you set a laser-etched acrylic plate that guides the light through its contours, creating a glowing 3D effect. The lamps come in a variety of neat designs, but the simple light-bulb shape is our favorite. One cool detail? The Bulbing Light's acrylic plate never gets hot—so you can move it around or switch out the designs in a snap.